McDonald’s USA LLC officials were in San Antonio Monday to announce the nationwide launch of a new effort designed to encourage kids to eat more fresh fruit. Starting today, all customers who order their children Happy Meals will automatically get either a fourth-cup or half-cup serving of apple slices with their choice of Chicken McNugget, hamburger or cheeseburger. Kids can still get a serving of french fries, albeit a smaller portion than the traditional Happy Meal size. Customers can order a second bag of apple slices in lieu of the fries. Happy Meals will come with the option of fat-free chocolate milk or 1 percent white milk. By adding fruit in every Happy Meal, McDonald’s hopes more children will get their recommended daily allowance of produce. 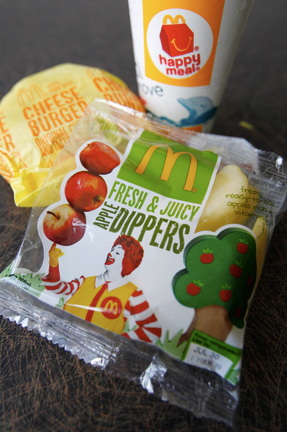 McDonald’s had been offering apples as a Happy Meal choice since 2004. However, only 11 percent of parents have been picking the apple slices as a Happy Meal option.